Hi guys! 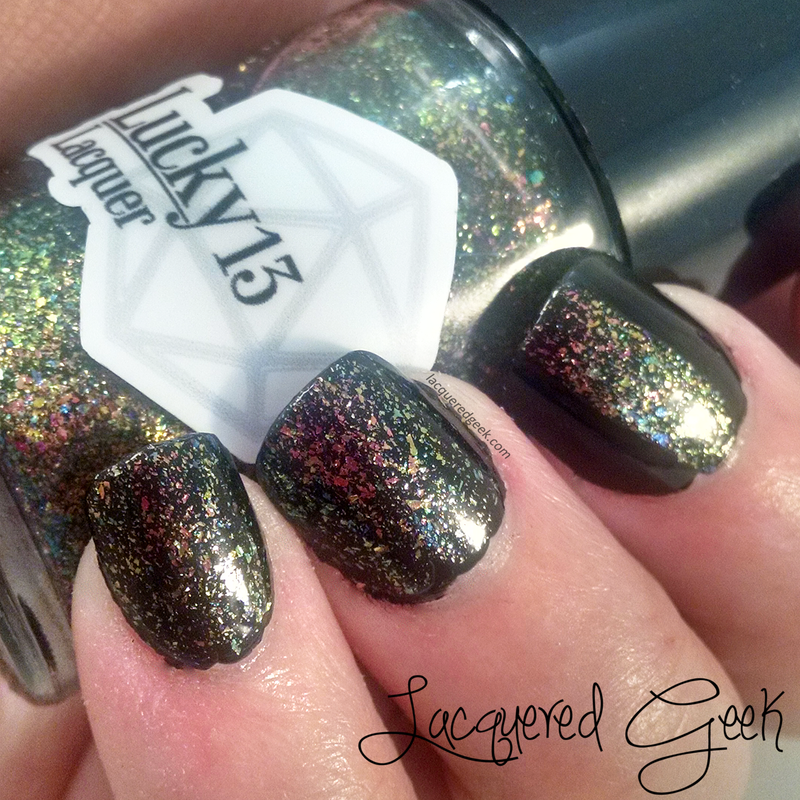 Today, I've got the first part of the Out of This World collection - the latest collection from Lucky 13 Lacquer. 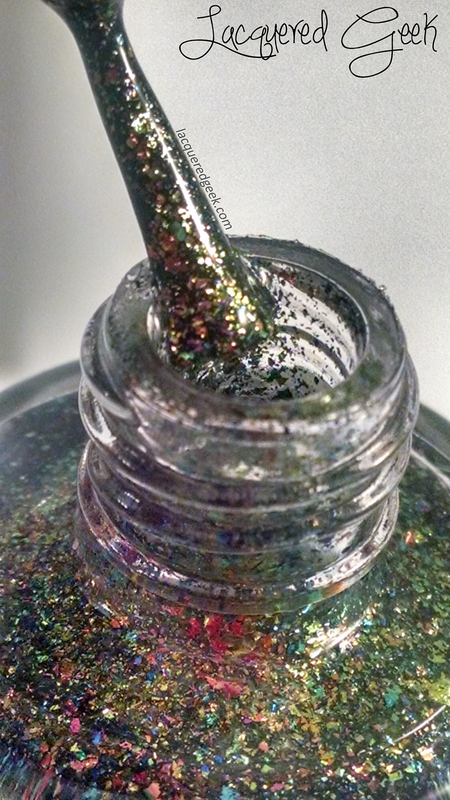 The recent craze that has been sweeping the indie nail polish world lately has been flakes. But for the smaller makers, the sheer cost of the flakes has made it hard for them to get on board. 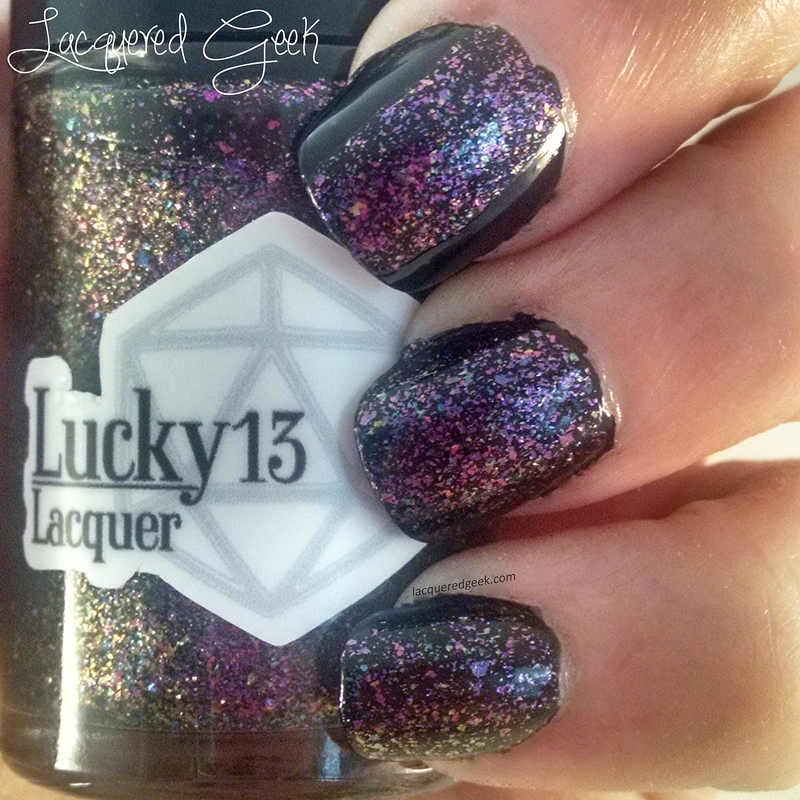 Lucky 13 Lacquer had another idea to complete with the bigger indie makers without going broke (and taking a big risk that the flake craze would end as quick as it arrived) - a Kickstarter campaign. 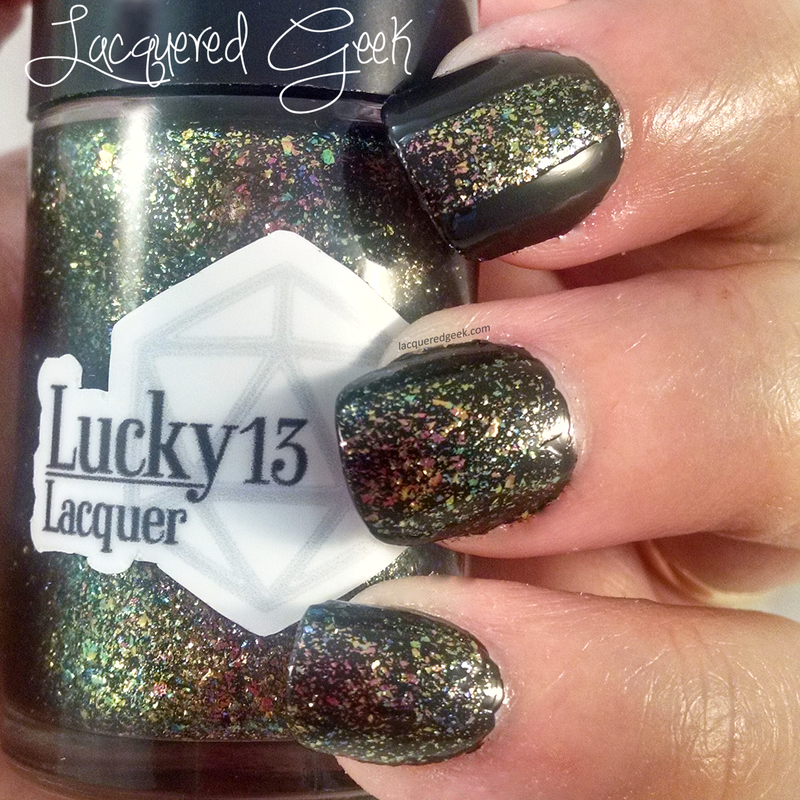 Seeing how Lucky 13 Lacquer is one of my absolute favorite brands, it was a no-brainer that I was going to be a backer! Since I'd would be picking up the entire collection anyway, I made sure to pledge at a level where I'd get the collection! Inspired by our amazing universe, the Out of This World collection is made up of 7 polishes - one cream polish, two chrome flake polishes, three iridescent flake polishes, and one silver flake polish. Today, I am going to show you the cream polish and the two chrome flake polishes. 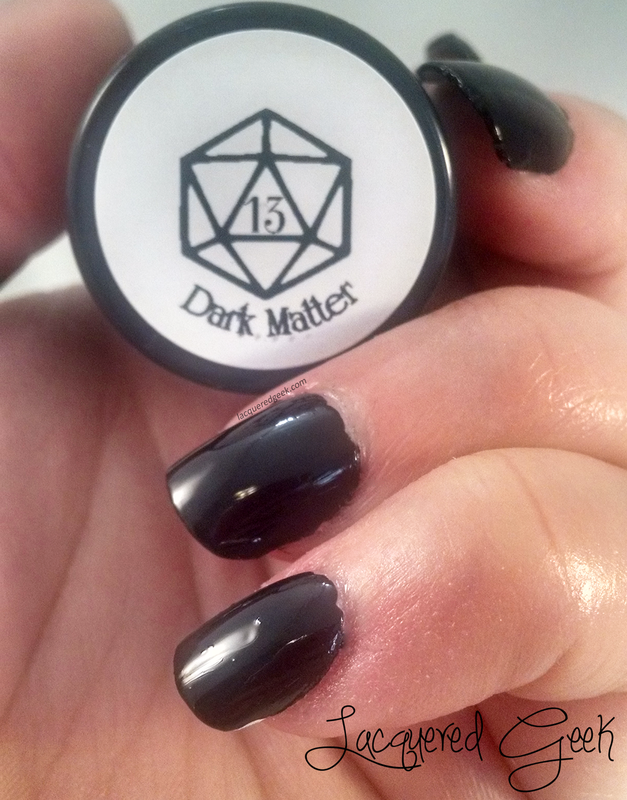 Dark Matter is a pure black cream polish. It makes the perfect base for this collection! With a self-leveling formula, it is perfection in one coat. No staining, no streaking, no problems! 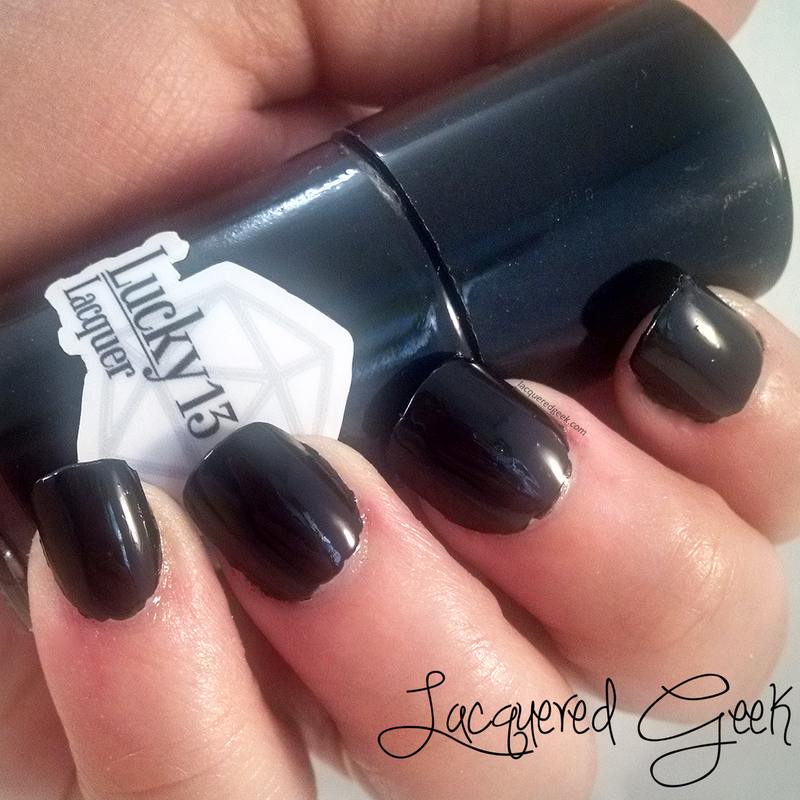 It dries shiny, but I topped it off with Elemental Ward, Lucky 13 Lacquer's quick dry top coat. 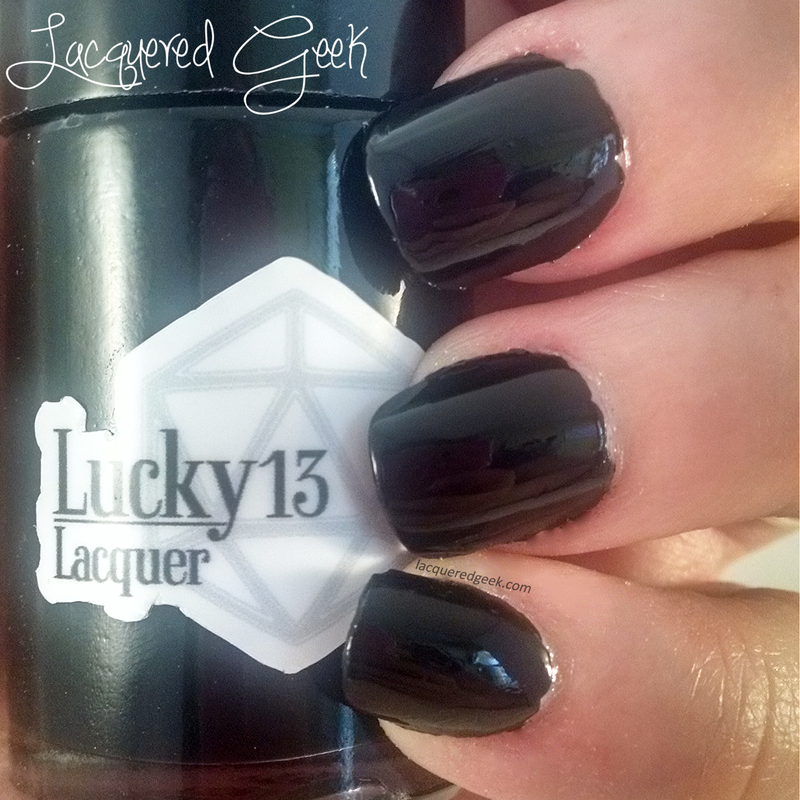 If you are looking for a new go-to black, then you need Dark Matter in your life! 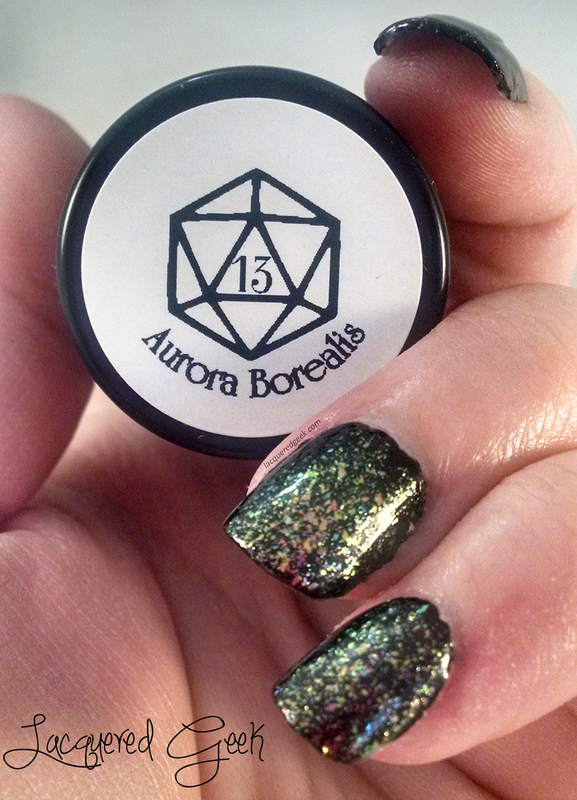 Aurora Borealis is one of the chrome flake polishes. It is a mix of copper, gold, green, and blue color-shifting flakes. It wasn't in the official description, but I saw flashes of pink as well. I am totally and completely in love this polish. I wore one thin coat over Dark Matter topped with Elemental Ward. 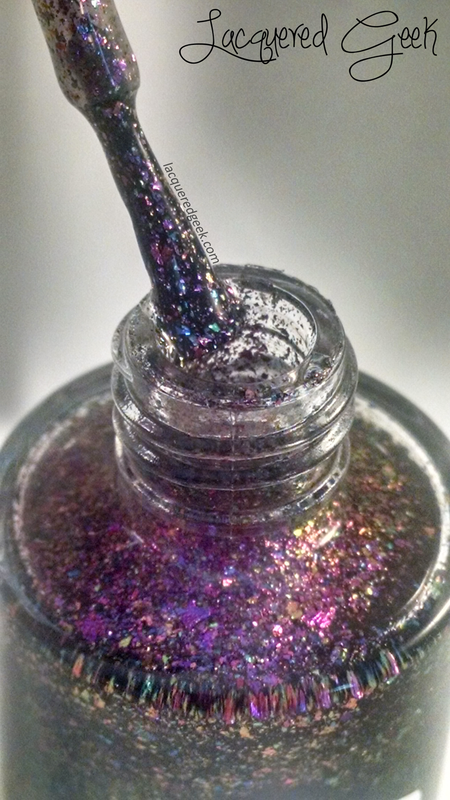 Supernova, like Aurora Borealis, is a chrome flake topper. It is a pink, orange, gold, and green color-shifting flakes. 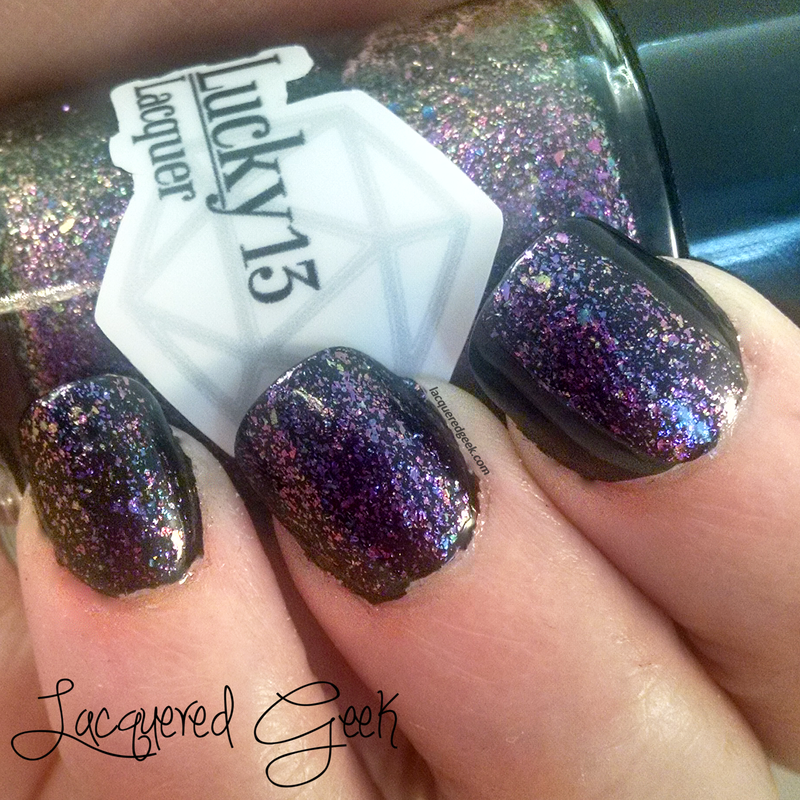 I used one thin coat over Dark Matter topped with Elemental Ward. You can do more coats for a more saturated look if you prefer. 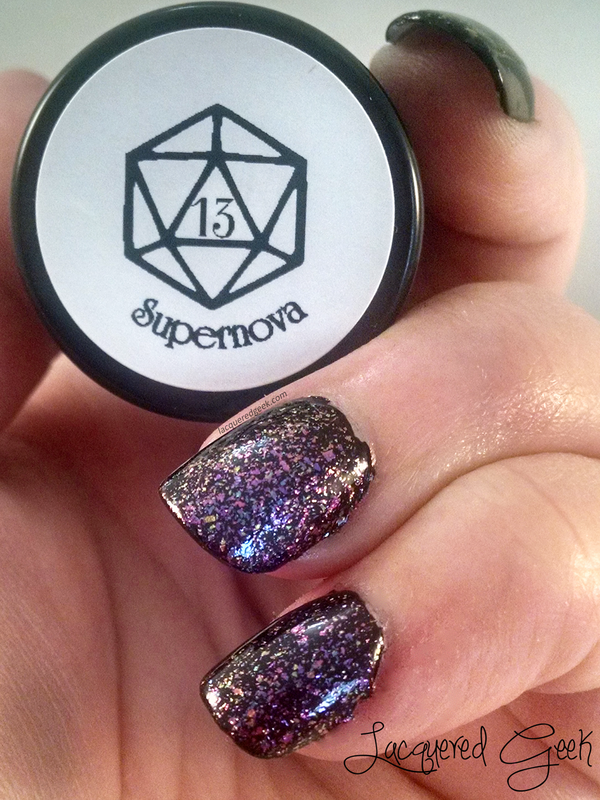 I could not get my camera to pick up the golden shifts of Supernova on my nails. My camera was like "NO! I like the purple, and that's all you need to see!" You see the shift in the first photo below, along the left side of the bottle. When I first saw the collection, I was sure Supernova would be my favorite, and I do love it. But Aurora Borealis is just gorgeous! I won't say if it's my absolute favorite of the collection until after I show the rest of it later this week! 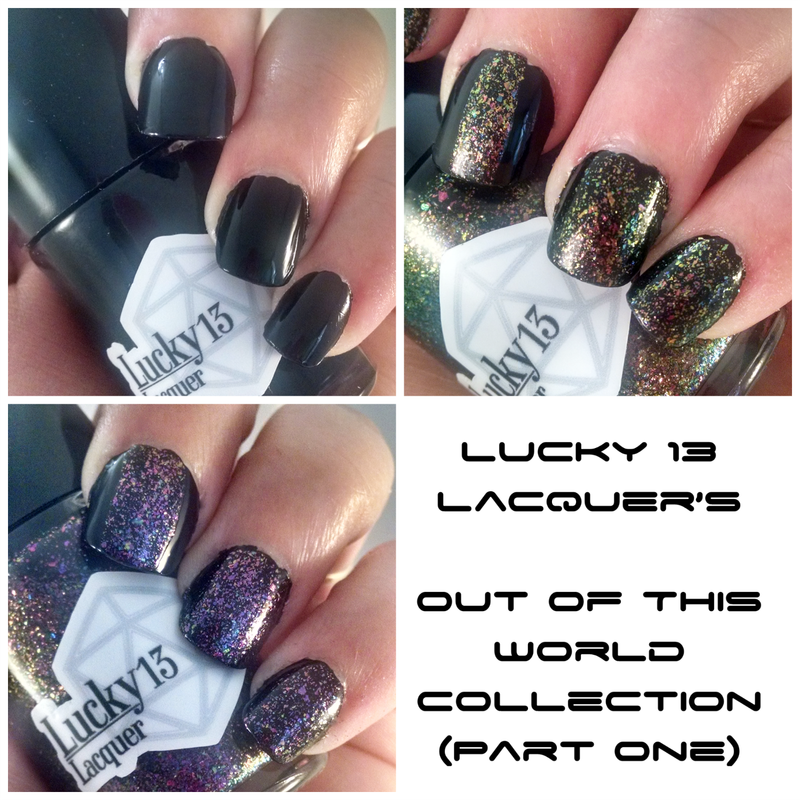 You can purchase any of the polishes from the Out of This World collection right now from Lucky 13 Lacquer's shop!